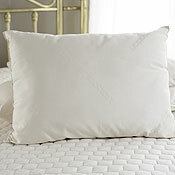 The Solus Organic Wool Pearl Pillow has been discontinued. This pillow has been discontinued. As an alternative we recommend the Sleep & Beyond Certified Organic Wool Pillows. Indulge in the unsurpassed pureness of our Solus Organic Wool Pearl Pillows. These pillows have no added chemicals or dyes and are naturally antibacterial, hypoallergenic and dust mite repellant. The unique Wool Pearl filling creates a fluffy yet dense pillow that is ideal for side sleepers and those who like a firmer pillow. Wool pearls are preferred over traditional wool filling because they increase the loft of the wool and softens the pillow to a medium-firm feel. Traditional wool filled pillows can become hard as a rock but with Solus wool pearls inside, the pillow will remain springy and supportive for extended comfort and use. DO NOT WASH. Protect the pillow with a pillow cover. Air the pillow seasonally to refresh. To revive loft, put the pillow in the dryer with two new tennis balls. Set dryer on air dry or the coolest setting possible. Our Solus Organics Bedding features top quality, hand-made products that continue to amaze our testing team. The Solus Organic Wool Pearl Pillows are made of the finest, purist materials, which make them loftier than most of their rivals. The wool pearls increase the loft and springiness of the wool fibers for increased comfort and longevity. Our Solus Organic Wool Pearl Pillows have a medium to firm feel and a high level of support which makes them a good fit for side sleepers. The wool pearl fill offers a nice improvement to the comfort of these pillows over traditional wool batting which can become rock hard. Due to the purity of the materials and craftsmanship, we highly recommend our Solus Organic Wool Pearl Pillows to those who suffer severe allergies and do not want to take a chance with hypoallergenic down or synthetic fills. 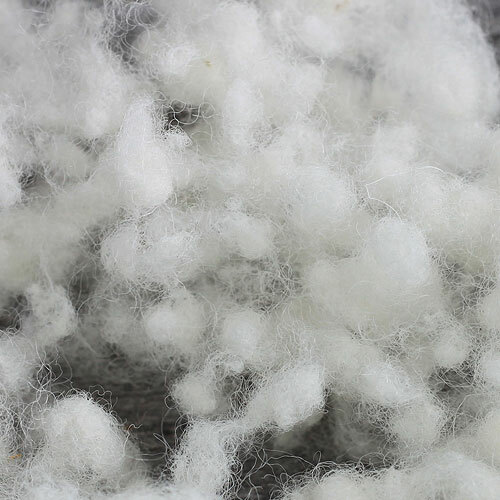 The pure wool filling is naturally hypoallergenic and inhospitable to dust mites. Although wool pillows are not as soft as down or other fills, they do provide excellent head and neck support and promote a healthy night’s sleep. Overall, our staff finds these to be the crème de la crème of all wool and combination wool & cotton pillows. These will truly help your body restore itself so you can be ready for the next day’s activities! Due to Federal Bedding Laws, opened or used bedding is NOT returnable unless due to defect as covered under the warranty. Our Solus Organics pillows have a 3 year limited warranty. This warranty covers defective stitching, clumping of fill and excessive loss of loft. It does not cover stains, soiling, burns, odors or changes to the fill or fabric due to washing. Washed pillows are void of the warranty.